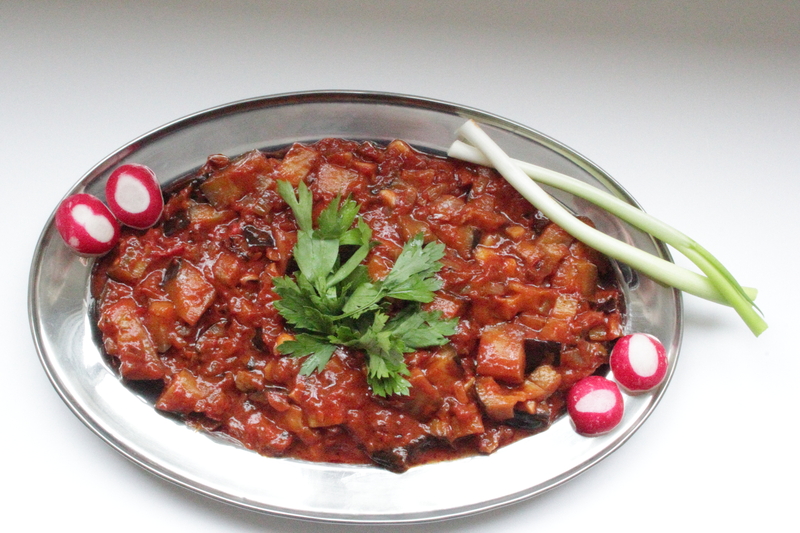 Betinjaan B’zeit (Aubergines in Oil) – Flogging Delicious! I’m an absolute sucker for aubergines – I love them fried, grilled, in the oven, in salads, dips, with rice – the list goes on! They’re such a versatile ingredient, and I love the earthy flavour and unusual texture they bring to different recipes. Growing up, my mum used to make a delicious, yet simple aubergine dish rammed full of flavour, that I have since adopted and made my own. This dish requires a generous amount of cooking oil, purely because aubergines really soak it all up. Begin by placing the oil in a large frying pan on medium heat. Once it’s hot, add in the chopped onions and fry until translucent, about 3-5 minutes. Then, drop in the sliced garlic and sauté for a couple of minutes. I really find that the garlic adds a lovely sweetness to this meal and, to me, it’s such a vital ingredient! If you’re not a fan of such a large amount, you can reduce the number of cloves to one you feel comfortable with. You can now add in the diced aubergines, stirring regularly until you see them start to soften. Once this happens, stir in your lovely, fresh tomatoes, season with salt, ground white pepper and fresh black pepper (though be careful not to accidentally drop all your peppercorns into the pan like my clumsy self has been known to do…). While your aubergines are cooking, pop your kettle on. After seasoning your food, grab a mug, drop in 2 tbsp of tomato purée, fill to the top with the boiling water from your kettle and mix until the purée is well combined. Pour this mixture into your pan, and turn the heat right up. As soon as it comes up to the boil, turn the heat down to the lowest setting, cover the pan with a lid and let the aubergines simmer for 15 minutes. After this time, have a taste of your aubergines to make sure they’re nice and soft. If they are, your dish is ready to be served. If not, keep them on the hob a little longer, and taste again. For me, this dish is absolute perfection served with Arabic bread, dunked right in. You can also enjoy this dish straight from the fridge the next day, as all the flavours will have really settled.